2 LyoBeta series A Responsible Choice New demands in R+D centers are related to scale-up feasibility and quality of procedures and research methods. FDA investigators consider that transfer of technology from R+D departments to clinical trials and later commercial production is often carried out with lack of strictness and poor documentation practices. Therefore, they are emphasizing the concept of cgmp as a means of quality control, comprising all practices in R+D and production processes. 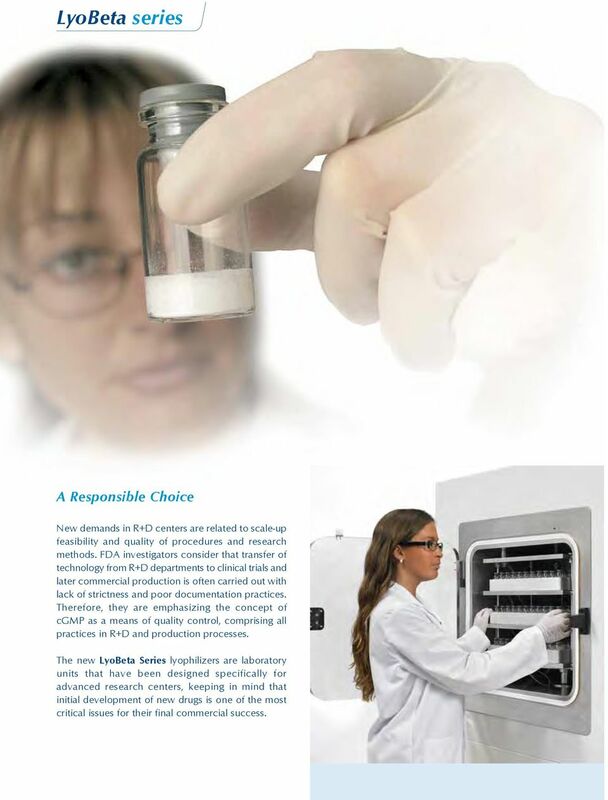 The new LyoBeta Series lyophilizers are laboratory units that have been designed specifically for advanced research centers, keeping in mind that initial development of new drugs is one of the most critical issues for their final commercial success. 3 Design features The LyoBeta is a compact unit with casters, constructed in a steel stove-enamelled cabinet. The equipment is supplied fully assembled, including the vacuum and refrigeration system and all necessary elements, ready for operation after connecting to the utility services. Efficient Design THE DESIGN OF THE UNIT OFFERS IDEAL CAPABILITIES FOR R+D ACTIVITIES. LyoBeta has been equipped with the appropriate components, devices and sensors to control and monitor processing conditions: temperature, pressure and time. This allows definition of the process variables to achieve adequate control and reproducibility. The equipment includes brazed plate heat exchangers, which when used in combination with other high quality components, YIELDS COOLING AND HEATING RATES OF 1 C/MIN (the same as production freeze-dryers). OPTIMIZATION OF PROCESS RECIPES IS EASILY PERFORMED BY MEANS OF THE CHAMBER CONDENSER VALVE, which enables pressure rise testing and thermodynamic control. This valve also facilitates proceeding with product loading and unloading without defrosting the condenser if it has not reached full capacity. 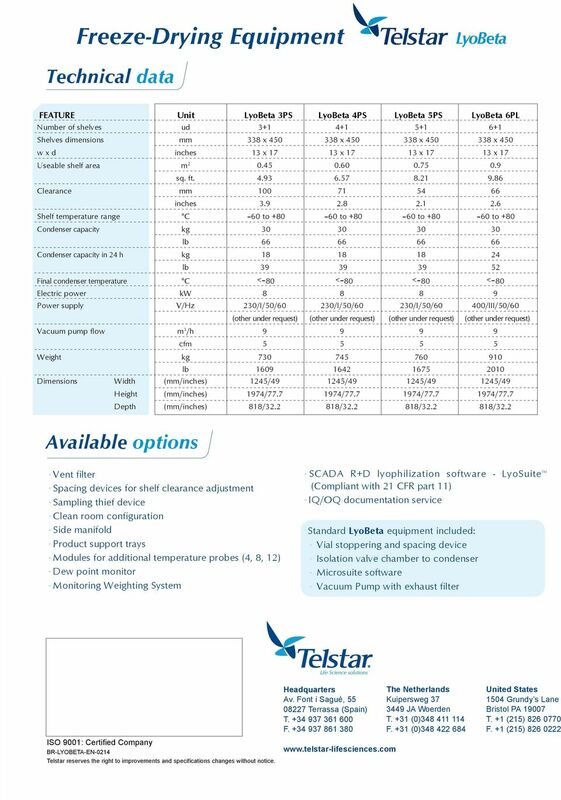 The refrigeration system is capable of reaching -80 C in the condenser and -60 C on the shelves. It uses HFC gases, which are authorized for use both at the present and in the long term. Flexibility of Use By using the stoppering device, the distance between the shelves can easily be modified, so THE UNIT CAN BE ADAPTED TO DIFFERENT PRODUCT FILL VOLUMES, VIAL SIZES AND/OR VIAL TYPES. Moreover, a lateral inlet port allows the connection of a three way valve manifold for the freeze-drying of CN 29/32 open flasks. 4 The best Solutions for Advanced Research Centers High Quality and Superior Craftsmanship THE CHAMBER AND SHELVES HAVE BEEN CONSTRUCTED WITH THE SAME PHILOSOPHY AS PRODUCTION UNITS. They are made entirely from stainless steel AISI 316 L and they are fully accessible inside for cleaning purposes. 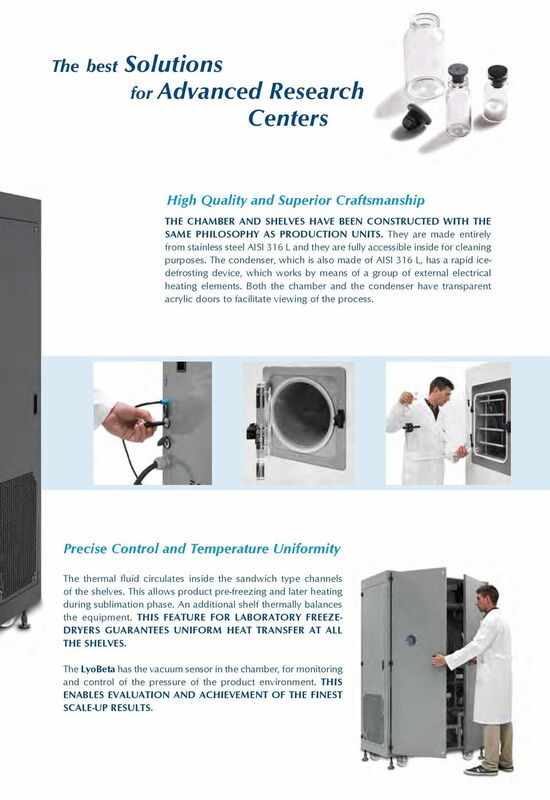 The condenser, which is also made of AISI 316 L, has a rapid icedefrosting device, which works by means of a group of external electrical heating elements. Both the chamber and the condenser have transparent acrylic doors to facilitate viewing of the process. Precise Control and Temperature Uniformity The thermal fluid circulates inside the sandwich type channels of the shelves. This allows product pre-freezing and later heating during sublimation phase. An additional shelf thermally balances the equipment. 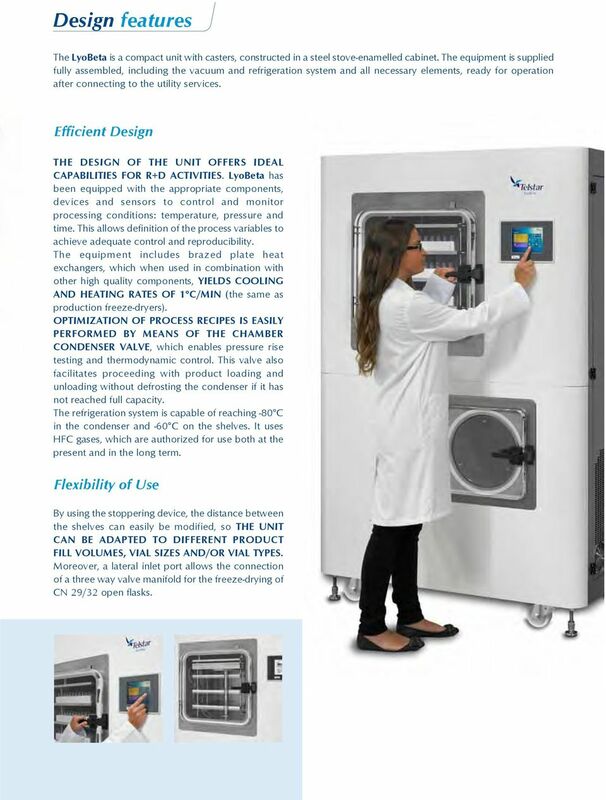 THIS FEATURE FOR LABORATORY FREEZE- DRYERS GUARANTEES UNIFORM HEAT TRANSFER AT ALL THE SHELVES. The LyoBeta has the vacuum sensor in the chamber, for monitoring and control of the pressure of the product environment. THIS ENABLES EVALUATION AND ACHIEVEMENT OF THE FINEST SCALE-UP RESULTS. 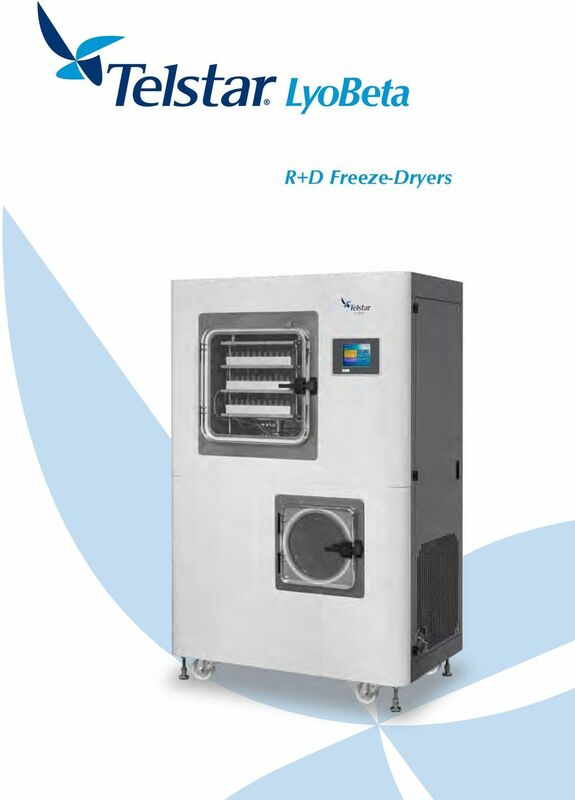 5 Control system Based on PLC and user Friendly TOUCH-SCREEN One of the main new features of the LyoBeta Series freeze-dryers is the incorporation of a non-proprietary PLC, instead of the classic microprocessor, more commonly used in this type of equipment. This system, fully proven in the industrial models, guarantees maximum reliability and reproducibility in the process, in accordance with the principles of cglp. The system allows control of the freeze-dryer functions via a graphic HMI (Human Machine Interface) user interface, which offers the following functionality: Displaying of information on system elements (valves, motors, indicators, etc.) Receiving alarm information Modifying the parameters of the freeze-dryer cycle Eliminating the possibility of error in operation Protecting the system from unauthorized use Recipes development Download info to USB key The user interface presents information in an attractive and intelligible manner on a graphical 6,5 color touch screen, through which different data screens can be accessed by means of touch zones. Optionally, the equipment can be connected to different peripherals, such as a chart recorder, printer or PC. When connected to a PC, two possibilities for working in the Windows environment are offered: LyoLogger A data logging programme which enables collection of data such as graphs, events, alarms and history (ASCII files) through a serial port. 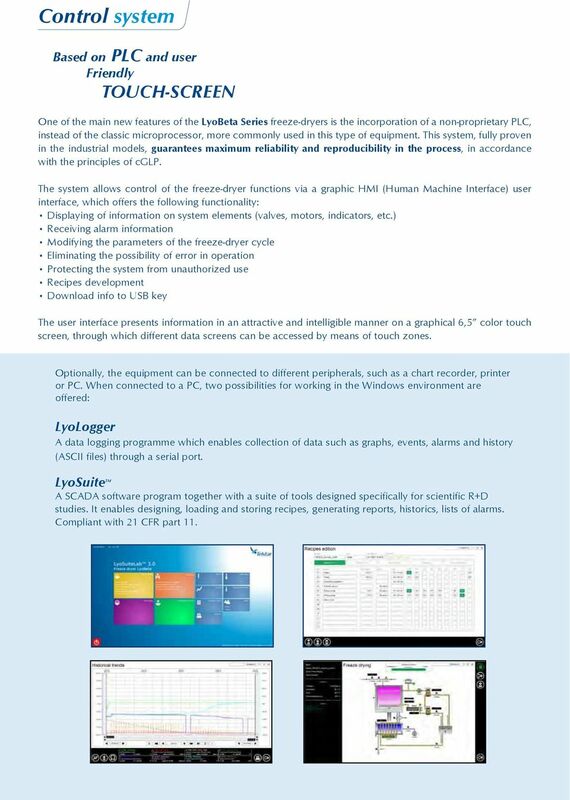 LyoSuite TM A SCADA software program together with a suite of tools designed specifically for scientific R+D studies. It enables designing, loading and storing recipes, generating reports, historics, lists of alarms. Compliant with 21 CFR part 11. SANDWICH/SALAD PREP & MEGA TOP UNDERCOUNTER REFRIGERATOR UNDERCOUNTER FREEZER Contents Specifications... 3~4 Installation. 5 Maintenance & cleaning.. 5 Operation & Installing Castors... 6 Trouble-Shooting..